The beauty and the beast? 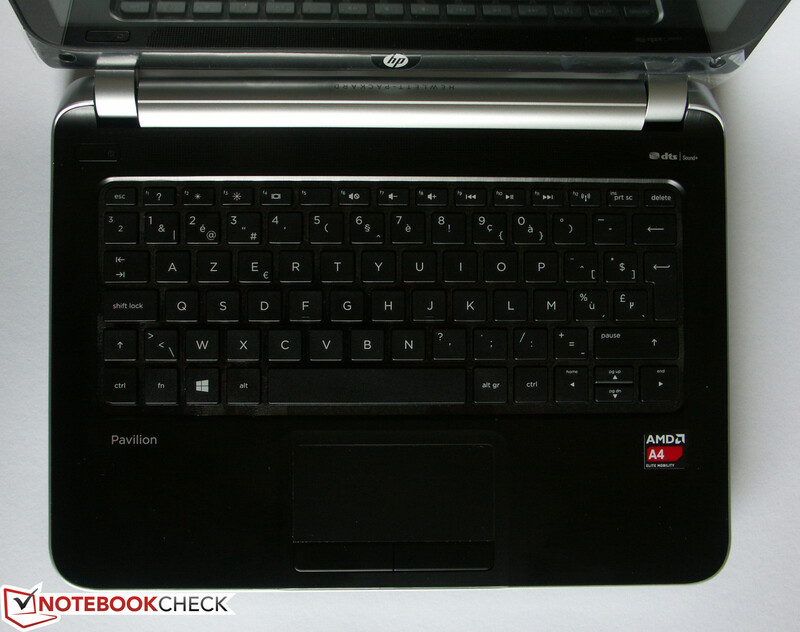 The HP Pavilion TouchSmart 11 looks nice, but can it offer enough performance with the AMD A4-1250? We will use the competitors, Lenovo IdeaPad S210 Touch 20257 and Acer Aspire V5-122P-61454G50NSS, for comparison in our test. These models belong to the same price category as our test model. The case of the TouchSmart 11 is made of anodized aluminum, which means the laptop remains cool. The display and case borders are silver in color and maintain the matte aluminum look. The display borders and the keyboard base are black, thus providing a nice contrast. Overall, the device is very sturdy and this high quality look gives the TouchSmart 11 an air of luxury. The TouchSmart 11 from above (closed). 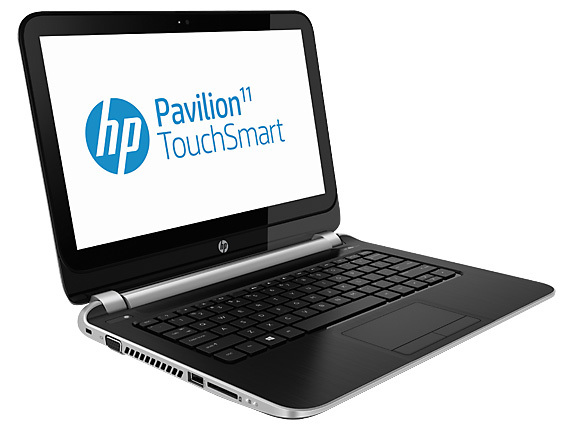 HP has not cut corners with the connectivity of the TouchSmart 11. The offering includes a VGA port (useful for projectors), as well as an HDMI port (not mini-HDMI). Furthermore, a 3.5 mm audio jack serves as both the microphone and headphone input/output. A WLAN module and a 10/100 BASE-T LAN port (RJ45) are included alongside 2x USB 3.0, 1x USB 2.0 and a multi-card reader. Overall, we felt the connectivity is sufficient and that the positioning was good. HP has chosen a Ralink (RT3290) WLAN module which supports the 802.11 b/g/n standards. We tested the connection quality with two routers - one was placed next to the laptop (around 2 meters; ~6.6 feet) and the other was placed two floors above our test platform (50 - 60% signal strength). There were no problems with the WLAN reception. The Ethernet adapter is not the latest as it only supports 100 MB/s (Fast-Ethernet), but thankfully, it is provided in this small notebook. Bluetooth 4.0 is also included in the Ralink module. 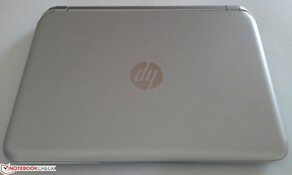 An "HP TrueVision HD webcam" provides a blurry picture even in 720p mode. Still, as this camera is not intended for recording HD movies, we consider it serves its purpose well as a webcam. The activity LED shows if the webcam is currently running and a digital microphone is included. The test model includes: a quick start guide, basic intro to Windows 8 and the warranty. The TouchSmart 11 is delivered with Windows 8 preinstalled (64-bit). Unfortunately, no Windows 8 DVD is included in delivery but a setup is provided on a partition in the device ("Recovery Partition") and it can be used with the "HP Recovery Manager" to secure the system. This means that the user can have a fresh install of the OS if need be. The "USB/Flash unit creation tool" creates an external boot device that can also be used for recovery/fresh installation. We recommend making a recovery device, whether it be DVD or USB, as one never knows when the hard disk might be damaged. 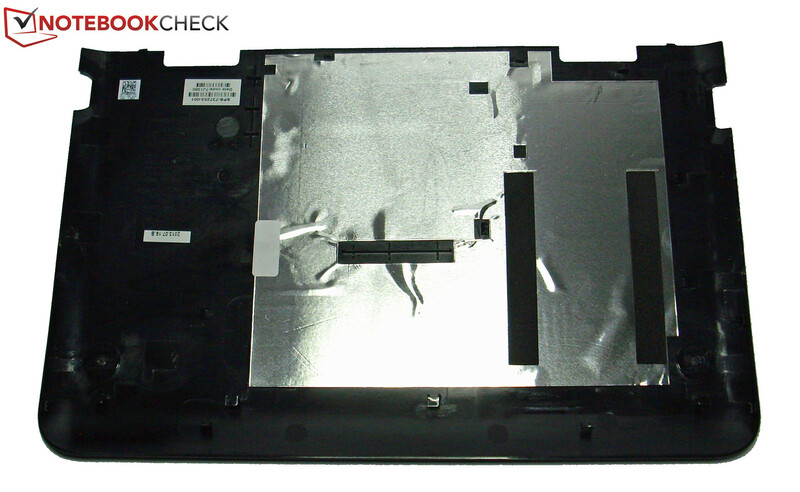 A maintenance flap is not to be found on the Touchpad 11. We had to remove the entire bottom cover, i.e. 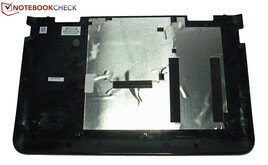 the base of the laptop, to access its insides (it can be argued that this is the maintenance flap). 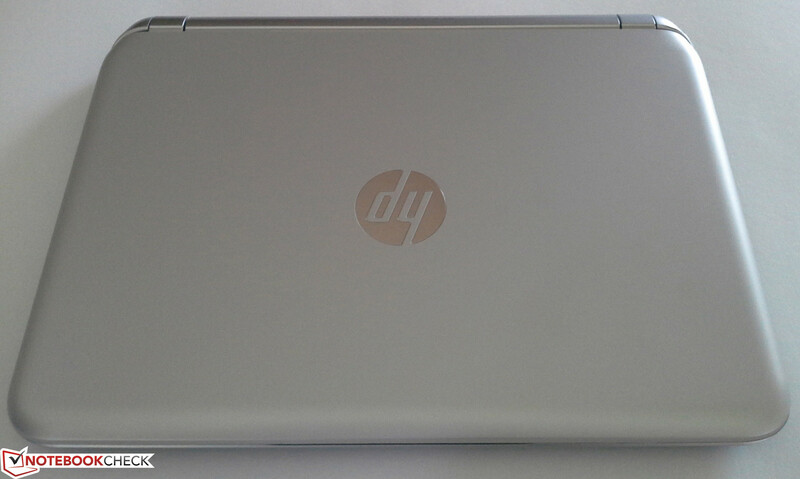 HP uses plastic hooks to keep the flap secured and as such, no screws have to be removed. We cannot say if this is good or bad, but we can caution the user to be extremely careful when removing this "flap": excessive force may result in unintentionally breaking a part. If it is not absolutely necessary, do not open the device! However, if it is necessary to get the device open, we recommend getting the HP service manual. The procedure is explained in it but sadly, it does not detail where the plastic hooks are placed. 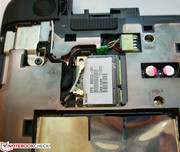 Once the "flap" is removed, the user will be able to access the HDD, the RAM and the WLAN module. If you wish to change the BIOS battery or clean out the fan, a few screws and a flap will have to be removed first (13 in total). We did not pursue this procedure in our review. 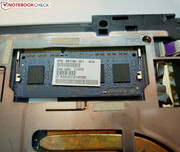 The TouchSmart 11 only has a single RAM slot, which is occupied by a 4 GB module. The service manual from HP lists two modules: 4 and 8 GB. We do not know if a large RAM module would be supported. The HDD can also be swapped out (for an SSD perhaps). The HDD slot offers sufficient space for a 2.5 inch HDD/SSD with a height of 7 mm. 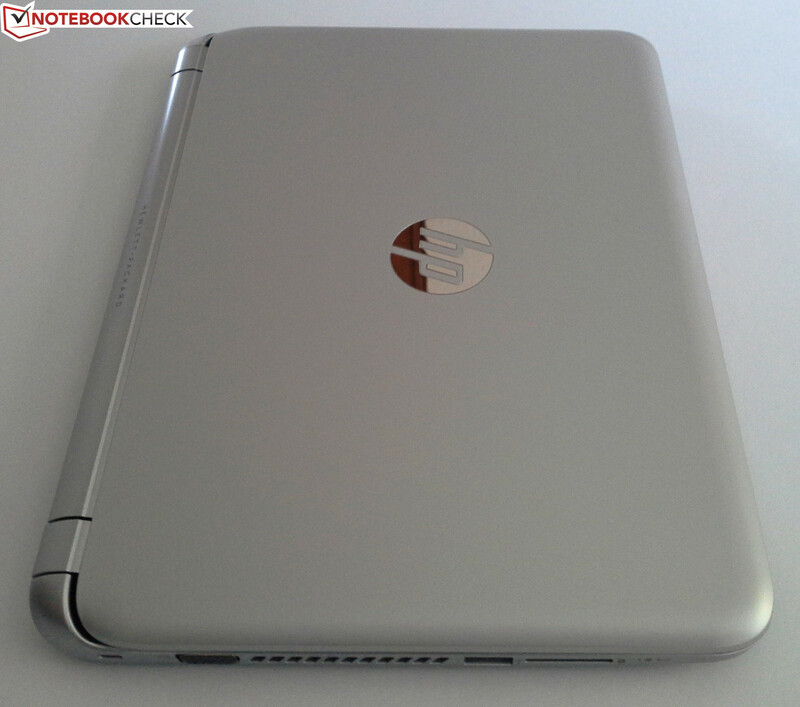 HP promises a one-year extension with Premium Service in the warranty (HP Care Pack Certificate). It is worth mentioning that the standard warranty is dependent on the country. Exact information can be found using the serial number on the HP webpage via the "HP Utility Center" (software that is preinstalled). The TouchSmart 11 uses a standard keyboard with isolated keys, which means that each key is spaced from the others (AZERTY layout). The keys have a short stroke distance and a clearly defined pressure point. The surface of the keys is slightly roughened which offers a nice typing feel. The key resistance should have been a little stronger, but we can live with it. The workmanship is good and there is no backlight. The 8.5 x 4.2 cm (~3.3 x 1.7 inches) touchpad is multi-touch ready and has a finely roughened surface, which allows the user to work comfortably and precisely. The touchpad is the same color as the device and the two separate keys have a clear pressure point. Furthermore, the user can configure various multi-touch gestures. The TouchSmart 11 has a good touchscreen. The input is received without delays and executed smoothly. This interface may require a little getting used to for some users but we feel that the user can work more intuitively with the laptop thanks to it. The TouchSmart 11 is equipped with an 11.6-inch WLED display with a native resolution of 1366x768 pixels. The average brightness of the screen is 174.55 cd/m², which is not very high. The competition can perform better: 238.4 cd/m² (Lenovo) and 206.4 cd/m² (Acer). The contrast ratio is 404:1 which is quite good. We measured the DeltaE levels (DeltaE 2000) and found the deviations to lie between 5 and 15 for most colors. Some colors even exceeded this range. Only black placed in the target range (DeltaE < 5). The SRGB and Adobe RGB color spectrums cannot be covered by the panel of our test model, but this should not bother the average user. We could not see any color anomalies with our naked eyes. The TouchSmart 11 can be used for working outdoors, but only if the user is seated in a shaded area. 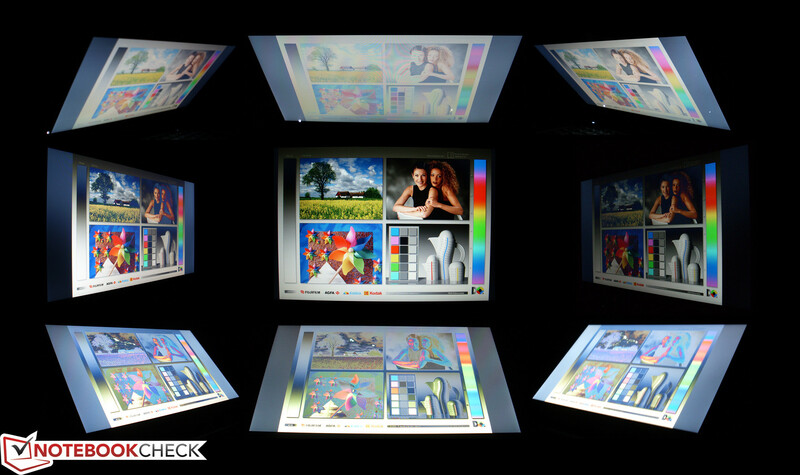 HP boasts of its anti-glare display, but the user is presented with an annoying problem: the glass surface of the touchscreen is host to a myriad of dancing reflections. Furthermore, the relatively low brightness limits the user to well-shaded areas or indoor use. The viewing angles of the panel are poor, as is to be expected of a cheap notebook. The picture quickly deteriorates if the vertical viewing angle changes. Horizontally, the user has more leeway as the change is not as great. From the sides, everything remains legible. However, the picture in the upper quadrants of the display seems darker. 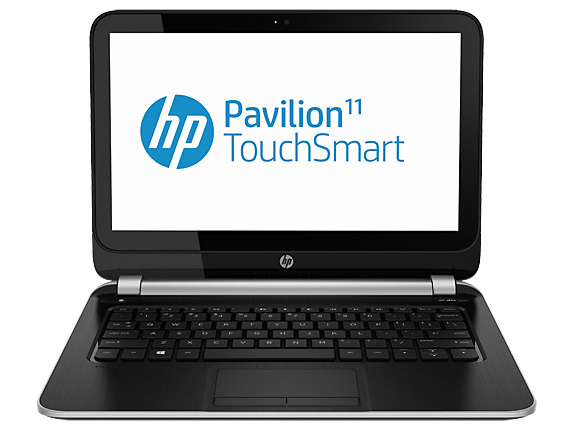 The HP homepage describes the HP Pavilion TouchSmart 11 as: "The compact and powerful HP Pavilion TouchSmart 11 notebook provides our users with optimal performance for every task“. We would like to underline the "powerful" part of this statement, as the AMD A4-1250 is a "low-performance" CPU. It is meant for everyday tasks (E-Mail, Internet or MS Office …), but users who want to run demanding graphics programs (like Photoshop or games) should consider other options. However, do not be scared off by the "low-performance CPU" tag as it also means that the laptop will run quite long. 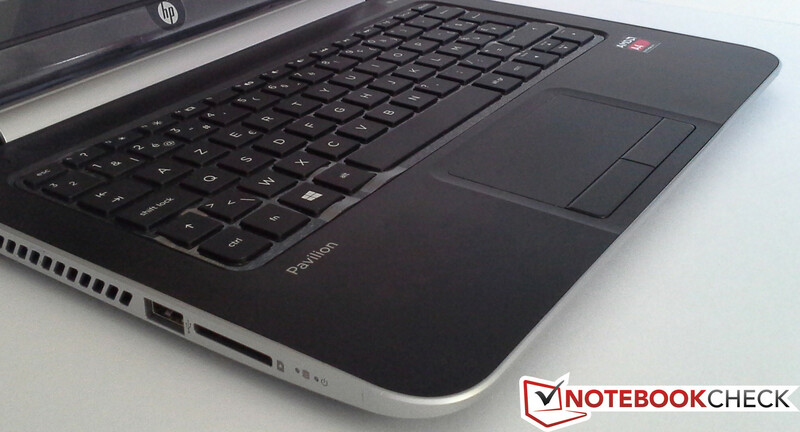 Our test model, the HP Pavilion TouchSmart 11, runs on the AMD A4-1250. It bears the codename Temash and is based on the new AMD Jaguar architecture. The mobile dual-core SoC runs at a clock speed of 1.0 GHz and has no Turbo mode. The Radeon HD 8210 IGP, DDR3L-1333 memory controller and Southbridge with the various I/O ports are integrated in the 28 nm chip. In comparison to other CPUs of the same size, our test model performs poorly. Cinebench (CPU-heavy) places the AMD A4-1250 APU behind the E1-2500, which is also from AMD. The Intel ULV Celeron 1017U is far ahead. Furthermore, the new Haswell Core i systems leave the test CPU in the dust: the Sony Vaio Pro 11 with Intel i5-4200U is 4 - 5x faster (depending on the test). The comparison with Intel’s latest Atom generation design, Bay trail, should be very interesting. 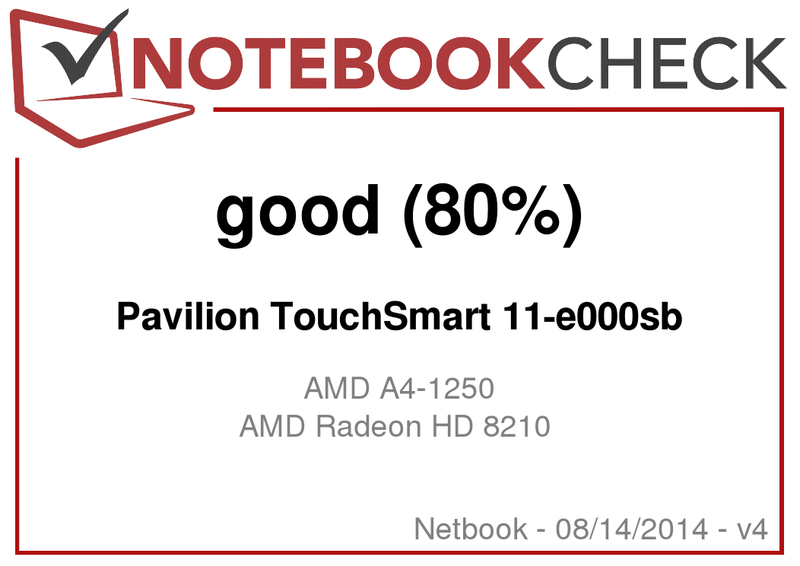 The Asus T100, equipped with the Z3740 CPU, scores at the level of the AMD A6 CPU in the Cinebench tests and is thus clearly ahead of the TouchSmart 11 in terms of CPU performance. Windows 8 is designed for multi-tasking but despite having two processing cores, the AMD A4-1250 is not destined to manage multiple programs simultaneously. Sometimes, starting a program can take so long that it might be best to take a coffee break and then get back to work. Once the application is open, the user can work without issues. 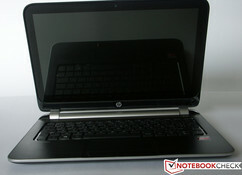 We still hope that HP will offer the laptop with an AMD quad core A6 in Germany (the US model, http://shop.amd.com/, seems to offer it). This would improve the multi-tasking capability of the system and the CPU also has the stronger Radeon 8250 integrated. In PCMark Vantage, the TouchSmart 11 is the last of the crowd. 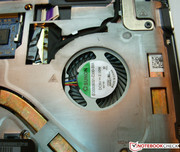 HP installs a SATA HDD in the TouchSmart 11 from Toshiba (model no. : MQ01ABF050). It has a capacity of 500 GB, which runs at 5,400 rpm. CrystalDiskMark records a reading rate of 103.6 MB/s. HD Tune records an average transfer rate of 84.8 MB/s. Despite the relatively small 8 MB cache, the 5,400-rpm HDD records good values. As previously mentioned, the AMD A4-1250 is used in our model. It includes the Radeon HD 8210 IGP with 128 stream processors (Radeon cores) and supports DirectX 11. The clock speed is 300 MHz. The results of the 3D Mark benchmark show that the TouchSmart 11 still ranks last. 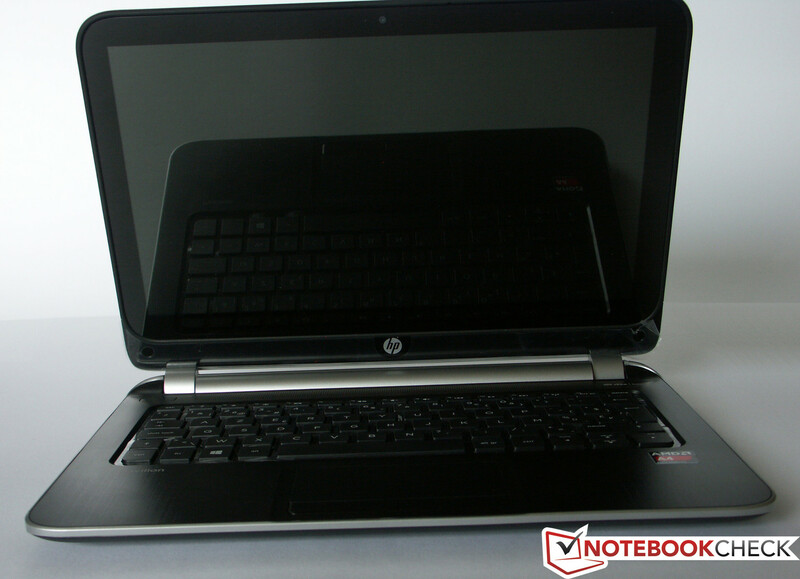 The second place is afforded to the Aspire V5-122P, which uses the larger AMD A6-1450 APU with Radeon HD 8250. 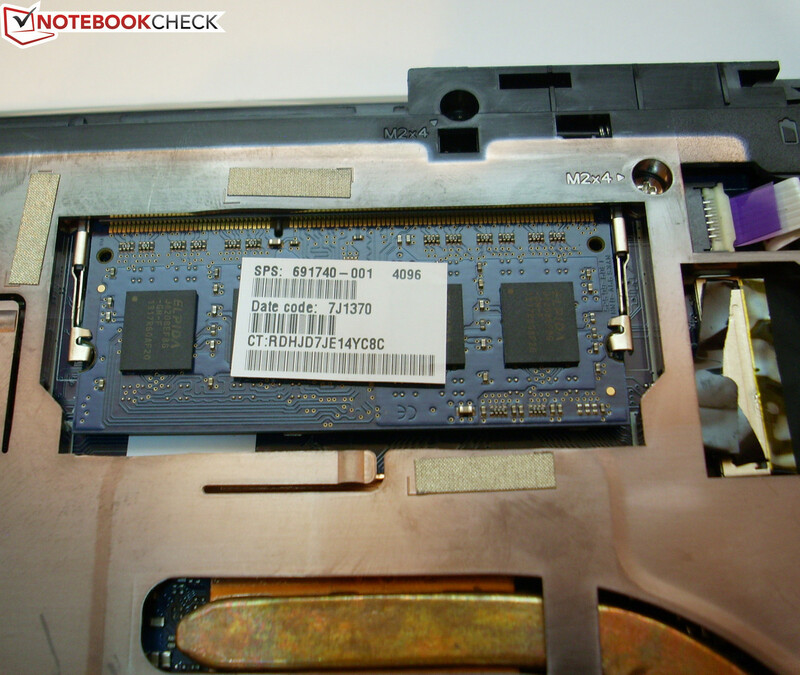 The IdeaPad with the Pentium 2127U CPU and Intel’s HD Graphics scores highest. The TouchSmart 11 is not intended for gaming. However, older games and some new games can be run. Most games launched at the end of 2013 will not be able to run on this GPU as the frames will be far too low. In our overview, "Computer Games on Laptop Graphic Cards", Diablo III (2012) ran at 13.6 fps at the lowest settings and Anno 2070 (2011) managed 23 fps. Games like Sims 3 (2009) and World of Warcraft (2005) should run fine as long as you do not push up the graphics settings too high. While idle, the test model is very quiet: 31.3 - 31.6 dB(A). The IdeaPad presents a similar behavior with its 30.7 - 31.4 dB(A) whereas the Acer Aspire V5-122 P is much louder 32.4 - 36.1 dB(A). At medium (3D Mark 06 running) or full load (stress test, Prime95 and FurMark) the IdeaPad emits 32.4 - 32.5 dB(A) and is much quieter than the competition. The TouchSmart 11 emits 33.0 - 38.6 dB(A) and the Aspire is the loudest at 37.8 - 41 dB(A). While idle, the surface temperatures are very low: between 24.3 °C and 25.1 °C (75.74 and 77.18 °F) (27 °C; 80.6 °F on the bottom). The IdeaPad is a bit higher at 26.4 – 29.7 °C (79.54 – 85.46 °F) and the Aspire is the only one that exceeds the 30 degrees mark clearly (26.1 °C – 39.2 °C; 78.98 – 102.56 °F). At load, the TouchSmart 11 remains quite cool 24.7 – 31 °C (76.46 – 87.8 °F) (35.5 °C; 95.9 °F on the bottom). 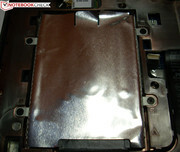 The IdeaPad stays between 26.8 – 30.1 °C (80.24 – 86.18 °F) and the Aspire is the hottest at 25.8 – 43.3 °C (78.44 – 109.94 °F). During the stress test (Prime95 and FurMark run for at least one hour), the clock speed of the CPU can drop by 100 MHz for a short while (from 1.0 GHz to 900 MHz). The chip temperature lies at 61 degrees Celsius (141.8 °F). The GPU works at its full speed 300 MHz the entire time and the temperatures eventually reach 61 degrees Celsius. 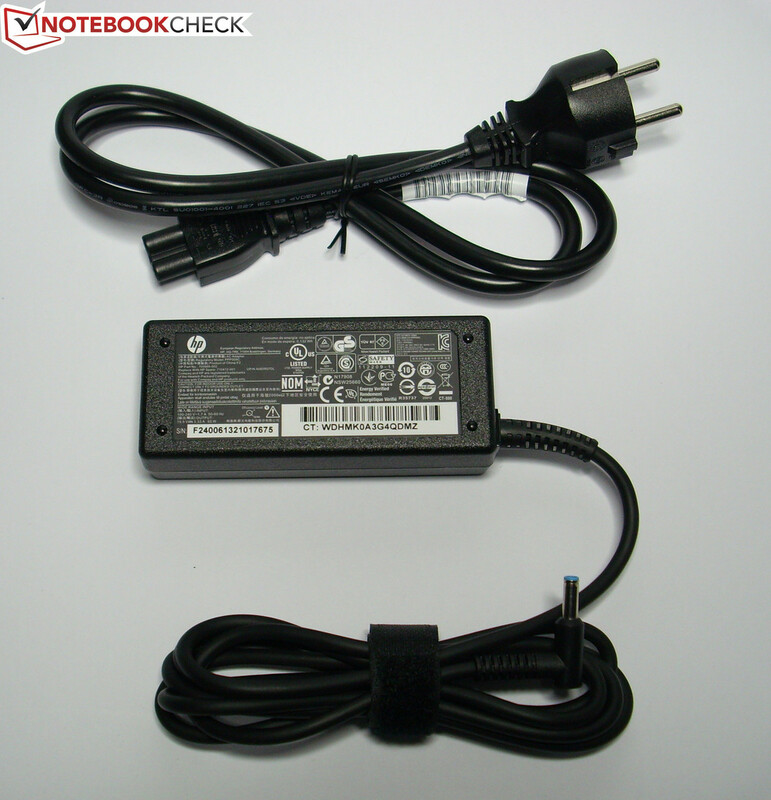 The power adapter is also in an acceptable range with temperatures of 26.6 °C (79.88 °F; idle) and 34.8 °C (94.64 °F; load). (+) The average temperature for the upper side under maximal load is 28.5 °C / 83 F, compared to the average of 29.8 °C / 86 F for the devices in the class Netbook. (+) The maximum temperature on the upper side is 31 °C / 88 F, compared to the average of 33 °C / 91 F, ranging from 21.6 to 53.2 °C for the class Netbook. (+) In idle usage, the average temperature for the upper side is 24.5 °C / 76 F, compared to the device average of 29.8 °C / 86 F.
(+) The average temperature of the palmrest area of similar devices was 29.3 °C / 84.7 F (+2.5 °C / 4.5 F). 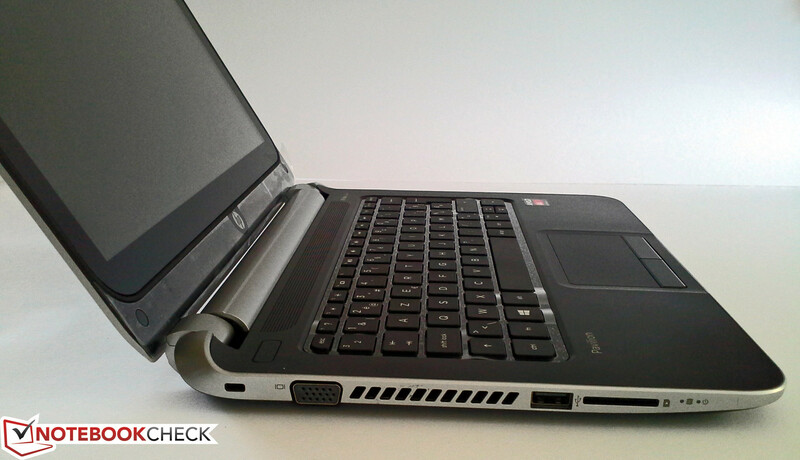 The stereo speakers of the TouchSmart 11 are placed near the rear of the laptop on the top of the base unit. They produce decent sound but due to the relatively low maximum volume it comes out a little tinny. Bass is non-existent but speech is understandable. Of course, the user should not expect hi-fi quality but attaching external speakers or headphones will provide a much better sound. While idle, the test model consumes 4.8 – 7.3 W - very conservative. 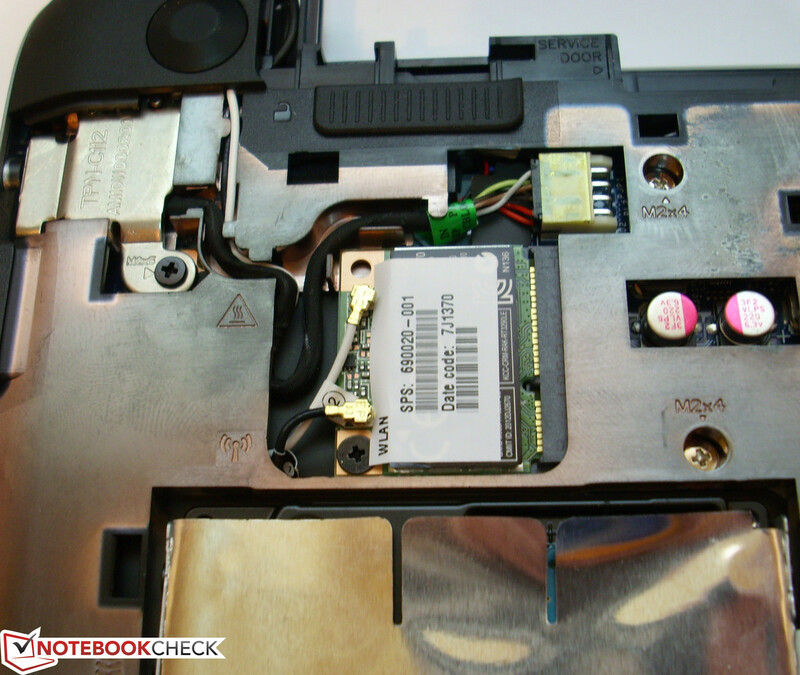 The IdeaPad requires 5.8 – 8 W and the Acer Aspire V5-122P requires quite a lot more (6.9 – 12.4 W). At medium load (3D Mark 06 running) and full load (stress test, Prime95 and FurMark running), the TouchSmart 11 scores in power consumption - it consumes at most between 13.6 - 14.2 W, which is quite low. In this test, the competition cannot keep up: the Aspire requires 18.3 – 23.3 W (with throttling) and the IdeaPad 210 needs 23.7 – 27.6 W (almost twice as much). The TouchSmart 11 scores full points. While idle, the Battery Eater Reader’s test (min. brightness and Windows "Power Saver" profile) records a run time of 9:01 hours. Second place goes to the Aspire V5-122P with 6:19 h. Final place is afforded to the IdeaPad with its 5:51 h.
Even at load (Battery Eater Classic test: max. brightness and Windows "High Performance" profile), the TouchSmart 11 runs 2:52 h whereas both competitors fall far short. The Aspire is empty after 1:53 h and the IdeaPad lasts a mere 1:19 h, once again taking final place. In the practical WLAN test, the TouchSmart 11 runs 4:23 h. Surprisingly, the IdeaPad 210 runs for 3:29 h and lasts longer than the Aspire (3:07 h). For the WLAN test, web pages are loaded every 40 seconds with the "Power Saver" Windows plan and brightness set to 150 cd/m². The batteries of the models have the following capacities: TouchSmart 11 - 36 Wh, IdeaPad - 36 Wh, Aspire - 30 Wh. The TouchSmart 11 has decent program performance and works very quietly. The notebook is not power-hungry and thus offers quite long run times. In the test, the two competitors could not keep up in terms of battery life. Furthermore, Premium Service extends the warranty period by 1 year. If you expect a fast desktop PC that reacts immediately and has no issues multi-tasking, then look elsewhere. At times, the computer will lag significantly. However, if you are willing to adjust to the system performance of our test model, then you will find the TouchSmart 11 a much cheaper choice than the more powerful competition. Overall performance is better in the competition: the IdeaPad S210 is ahead by 23%. As mentioned before, the price tag of 365 Euros (~$497), makes the TouchSmart 11-e000sb an attractive choice! The test model will face fierce competition from the TransformerBook T100 from Asus, which is priced similarly and uses the latest Bay Trail technology from Intel. You can expect an in-depth analysis of the upcoming Transformer in a few days here at Notebookcheck. The low noise emissions and the extra year of coverage thanks to Premium Service. The hard-to-access USB ports: at times we felt like the USB stick would break - be careful! 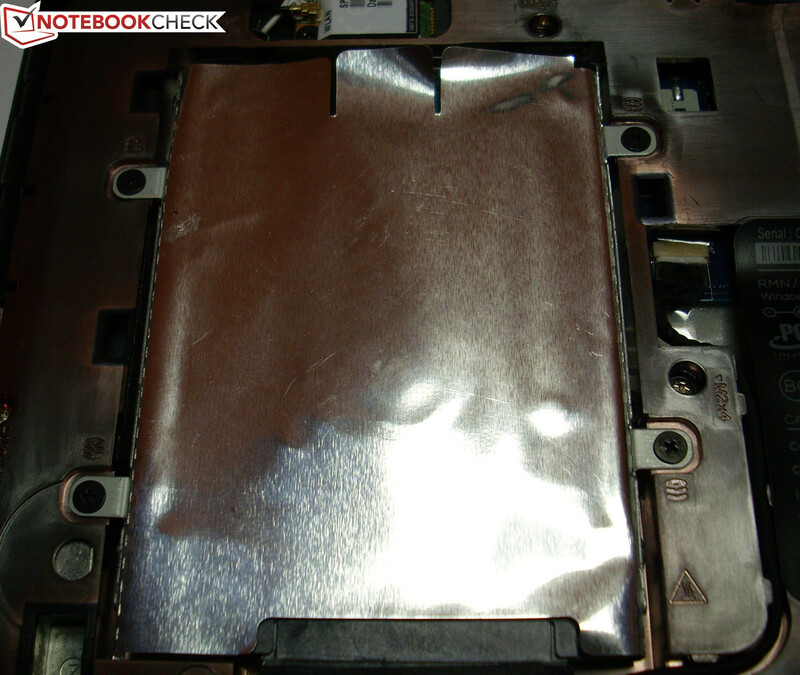 The long-lasting battery of the notebook.